C.D.R.G. 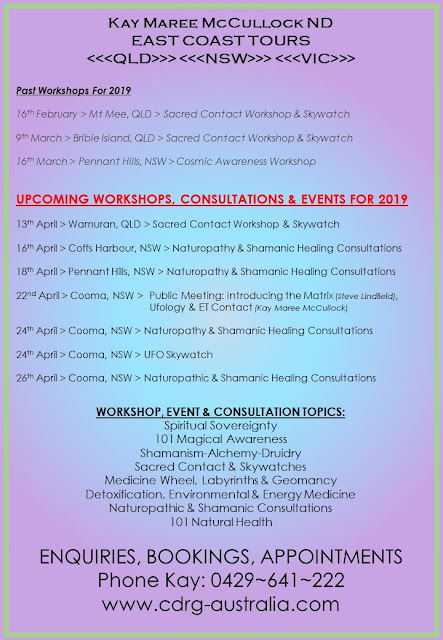 (Australia) will be doing a Presentation on ET Contact, a 'Mini' Training into the basics CSETI CE-5 Protocols and Techniques (to get you started), followed by a Skywatch that same evening. * Skywatch - Arrive at Location by 5:30pm and Finish at 10:30pm. * Meeting Location - Halcro Street Community Centre, 30 Halcro Street, Point Vernon, Hervey Bay, Queensland. * Skywatch Location - this will be given to Registered Participants only (via email). Please bring a notepad and pen to the meeting. Once you have registered via email or phone, you will be sent relevant information about the Skywatch. You can also do this at the meeting. But it is better to let us know prior so we can send you some more info so that you are prepared.